Just in case you're looking for funding for an individual or institutional project related to the promotion, development and conservation of Philippine culture and arts, take a look at the Competitive Grants Program of the National Commission for Culture and the Arts (NCCA). The deadline for submission of proposals is 31 August 2009. The National Committee on Libraries and Information Services is providing grants for regional conferences (4 slots), research (8), publication (4), and collection enhancement (12); and the National Committee on Archives has funds for seminars and workshops (5 slots), international travel grants (2), organization of documents from churches declared UNESCO World Heritage Sites (4), preservation and conservation of archival materials (2), and research (1) and printing (1). Note that certain slots are intended specifically for projects to be implemented in NCR, Luzon, Visayas and Mindanao. Budgets per project range from 150,000 pesos to 500,000 pesos. The maximum budget for all travel grants is 75,000 pesos. August is Buwan ng Wika (Language Month). This year's theme is "Wikang Filipino: Mula Baler Hanggang Buong Pilipinas" (The Filipino Language: From Baler to the Rest of the Philippines). It's not quite August yet, I know, but requests have already begun to come in, and that's why this post is up earlier than usual. 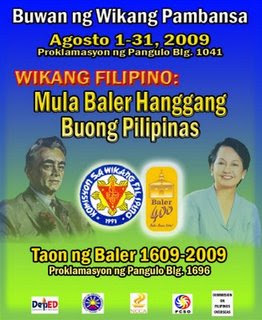 If you're wondering why Baler, Aurora, has been singled out, the poster above (via PLAI-STRLC) provides a clue: it's 400 years old (see Baler 400). But does the importance accorded its anniversary imply that the Filipino language began in Baler four centuries ago? No reasons are given in DepEd Memo No. 295 s.2009 (pdf), which sets forth the celebration's objectives and weekly themes, or even Proclamation No. 1696 (pdf), which declared 2009 as "The Year of Baler." But perhaps the answer is right there on the poster: Manuel L. Quezon is not only recognized as the father of the national language, he was also born in Baler. Anyway, the Komisyon sa Wikang Filipino (KWF) is sponsoring the Gawad Surian sa Sanaysay, which offers cash incentives of P5,000 for three runners-up all the way to P20,000 for the first prize winner. All entries must be postmarked or received on or before 7 August 2009, 5:00 pm. In "Why few Filipinos abroad register for 2010," it is suggested that Filipinos overseas do not bother to register for the 2010 elections because they are worried that their votes won’t be counted properly anyway. I don't agree. The two main reasons overseas Filipinos like me do not register is that they do not know that they can, or even if they know that they can, sometimes they just can't. 1. The Philippine Consulate in Toronto has no information about overseas absentee voting. There is an image with the phrase "Learn More About Overseas Absentee Voting," but clicking on it leads to a dead link. 2. The Comelec and DFA websites are either down or load very slowly, and are not always the the easiest to navigate, read or understand. I was able to download the Overseas Absentee Voting Form, but when I tried doing it again just now, I couldn't. So I uploaded it to Scribd, and if you click on the link above, you can download the form there. 3. I finally learned that the deadline for registration was 31 August 2009, and that all I had to do was bring my passport to the consulate, fill up the form and have my biometrics taken. Thankfully, I had been to the consulate before and knew where to go. And I was surprised to learn that it was so easy. I was in and out in less than five minutes. I was also told that my voter's ID and ballot would be mailed to me, so there's no need to go back to the consulate. My conclusion? The people in charge of the process know what they're doing, it's the people in charge of the websites who need to attend sessions on web design and usability. 4. Finally, there's the fact that the consulate is not easily accessible in terms of its location and office hours. Unlike most overseas Filipinos who would most likely be interested in registering for the 2010 elections, I am a student and can make the trip to register on just about any day. The majority, however, will very likely have to take a day off from work. And that's not counting those who do not live within a few hours of the consulate. 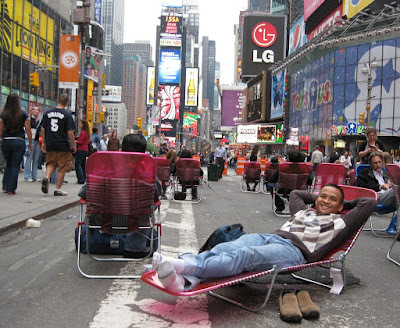 My suggestion: Set up shop at malls or churches during the weekends. There will be problems and costs involved, of course, but are they or are they not serious about this? I'm sure solutions and funding can be found. Kung gusto, maraming paraan; kung ayaw, maraming dahilan. The letter above, written by the chief of the PRC's legal division, closes the door on the non-BLIS and non-MLIS graduates who were unable to take the Librarians' Licensure Exams last year, the deadline prescribed by R.A. 9246. Updated 29 July 2009: Repeaters, regardless of degree, will be allowed to take the exam. The 2009 Librarians' Licensure Exams will be held in Manila, Baguio, Cebu, Davao, Legazpi & Zamboanga on 10-11 November 2009. The deadline for the filing of applications is 21 October 2009. Thanks to Fe Angela Verzosa for sharing the letter above at the Filipino Librarians Googlegroup. 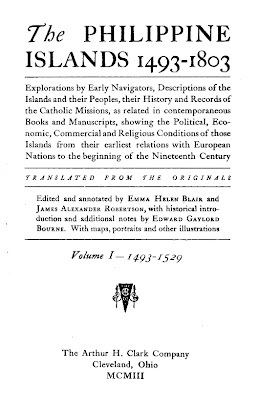 Its official title is The Philippine Islands, 1493-1898, but this 55-volume collection—primarily English translations of books and documents originally written in Spanish—is more popularly known as "Blair and Robertson," after its editors. The entire collection is freely available online at The United States and its Territories: 1870-1925: The Age of Imperialism (USIT), which I have previously dubbed "the best and largest online collection of Filipiniana materials available for free." I've linked to "Blair and Robertson" before in "Filipiniana Online: Links Shared at Rizal Library International Conference," but very few people seem to have seen it. Thanks to Maita's "reference question," I decided that it was time to give "Blair and Robertson" their own post. As the photos below will suggest, I got some research done at the New York Public Library, visited the Philippine consulate and marveled that Pacquiao's billboard was still up more than a month after he knocked out Hatton. But as usual, I spent more time—and money—watching Broadway shows. I went to lotteries, of course, and—what else is new?—didn't win. It looks like my Wicked experience was really beginner's luck. It got so bad, that I even considered buying full-price tickets from the Broadway Concierge & Ticket Center for some sold-out shows. So what did I end up seeing? Altar Boyz, Hair, In the Heights, South Pacific, and West Side Story on Broadway and off, and Cirque du Soleil's Kooza. I had discount codes for two of them, bought partial view and student rush tickets for two more, purchased one at TKTS, and was treated by a good friend to an excellent orchestra seat for the best show I saw on this trip. By the way, I skipped Billy Elliot, this year's Tony winner for best musical, because I had already seen it last year in London. Altar Boyz was forgettable, and Kooza did not quite live up to my expectations that were probably unjustly inflated by gushing reviews of other Cirque du Soleil productions. Hair deserved its Tony award for best revival over West Side Story, but I wasn't all that impressed with either one. But I did like In the Heights and South Pacific very much. Rickey bought us tickets for In the Heights because he felt guilty that he missed joining me at a lottery. It's a good thing he did because I had already decided to pass on last year's Tony Award winner for best musical. What I liked about In the Heights was the fact that it is very now and that it has a familiar Filipino feel—perhaps because it's about a Hispanic neighborhood—from the emphasis on getting a degree to the shame that accompanies not being good enough to the importance attached to winning the lottery to the preoccupation with gossip. The fact that I had no idea what it was about and that I had an excellent view from an expensive orchestra seat (free!) probably contributed to my appreciation of the musical. In contrast, I was prepared not to like South Pacific because I had seen the movie and a Repertory Philippines production, listened to the original cast recording many times and had read about almost every aspect of its journey from book to musical to movie. In short, I knew what it was about, and had fairly high expectations. And this production met or exceeded all of them, from the actors to the orchestra to the wonderful sets. But perhaps the most important detail of all was the fact that this was the best $20 seat I bought for a Broadway show ever. I got this cheap ticket, in particular, because I had a student ID. Usually, such discounted tickets get you a seat in the front row, back row or some not-so-good seat. But because just about any seat at the semi-circular Vivian Beaumont Theater has a great view of the stage, it did not matter at all that I was not in an orchestra seat or sitting in the center.